Best Little Emulator Ever Made! Having a dream in the world of game production is a little like moving to Japan: The culture is different, they speak a language you don't understand, and you run into more problems than you'd ever thought possible. In 1998, a small cadre of people in Los Angeles came together with one simple dream: to bring the world of PlayStation gaming to the PC. Sure, there were other emulators - programs designed to make a PC "think" like a console - out there, but they were hoary things that ran like they were moving through mud. 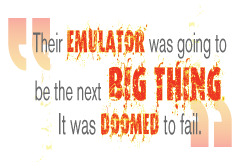 Their emulator would be different; their emulator would zip and work perfectly; their emulator was going to be the next big thing. First, a little background: Emulators work by reverse engineering the software and hardware processes on a console (or any device which you'd like to mimic). When bleem! 's team formed, early consoles were already popular: Super Nintendo, Nintendo, Sega Genesis, all were relatively easy to bring into existence, because a computer can easily crunch 8- and 16-bit numbers on top of running an operating system. The PlayStation was a different beast, however. Rather than working from storage cartridges with 256 MB of space, it could read from multiple CDs containing full-motion video and 3-D graphics. And that addition of a third dimension made emulation especially difficult, because emulator developers had to reverse engineer the way consoles processed information through their proprietary graphics accelerators. Emulators at that time used software rendering to create the 3D graphics, which proved too much for even top-of-the-line machines in the late '90s. The real star of the PlayStation emulation scene was bleem! (short for the Best Little Emulator Ever Made). Coded in assembly, this small executable made use of video cards on PCs and used filtering technology that, in many cases, made the games look better than they did on the actual PlayStation. Also, unlike most other emulators, bleem! worked on compatibility for each individual game, instead of trying to generally reverse engineer the console process. Elsewhere, the concept of emulation was viciously attacked by the Interactive Digital Software Association (IDSA, now the Entertainment Software Association [ESA]). In 1998, the "great sweep" took place, shutting down most of the major emulation sites in existence within a six-month period. But they had no preparation for the flood of emulators that appeared in 1999, chief among them bleem! All the major players were concerned. Console manufacturers often lose a great deal of money on the consoles and make up for it in licensing fees for games. At the time, Sony's per-game licensing fee was around $10, its largest profit margin. If people could play PSX games anywhere they liked, how could Sony justify that exorbitant fee?